Have you ever wanted an iPhone App that will allow you to see advertisements? Yeah, we haven’t neither. 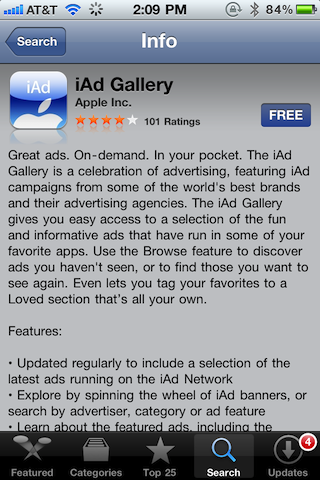 But that didn’t stop Apple from releasing iAd Gallery, a free App that will show you great ads, on-demand. It gives you easy access to a selection of the fun and informative ads that have run in other apps. This is going to be a hit.